The best thing – in Shadow’s opinion, perhaps the only good thing – about being in prison was a feeling of relief. The feeling that he’d plunged as low as he could plunge and he’d hit bottom. He didn’t worry that the man was going to get him, because the man had got him. He did not awake in prison with a feeling of dread; he was no longer scared of what tomorrow might bring, because yesterday had brought it. After three years in prison, Shadow has served his time. But as the days and hours until his release tick away, he can feel a storm brewing. Two days before his release date, his wife Laura dies in a mysterious car crash, in adulterous circumstances. Dazed, Shadow travels home, only to encounter the bizarre Mr Wednesday, who claims to be a refugee from a distant war, a former god and the king of America. Together they embark on a very strange journey across the States, along the way solving the murders which have occurred every winter in one small American town. 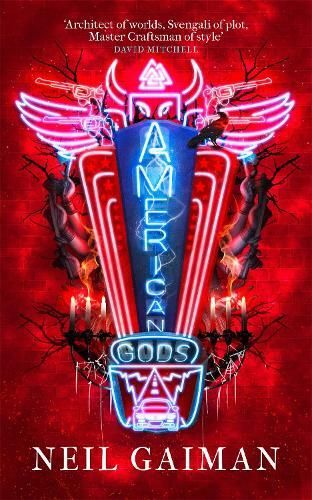 American Gods by Neil Gaiman, the epic road trip novel from the Sunday Times bestselling author of Norse Mythology, is an imaginative masterpiece and now the hottest TV series of 2017 starring Ricky Whittle, Ian McShane and Gillian Anderson and broadcast on Amazon Prime Video in the UK. 'Gaiman is a treasure-house of story and we are lucky to have him' - Stephen King. Primarily known as Britain’s foremost fantasy writer, Neil Gaiman is, as any of his readers and all Waterstones’ booksellers will know, much more than just that. Known by his colleague, co-author and regular illustrative collaborator Chris Riddell as the ‘wise wizard’, Gaimain’s is the mind that changed the course of the modern graphic novel through his Sandman series. In a multi-faceted career that has seen him variously as a short-story writer, screenwriter and critic he has also created such brilliant children’s classics as The Graveyard Book, Odd and the Frost Giants and Coraline and mastered blending the real with the wonderful and strange to deliver a stunning array of fantasy novels, contemporary myths and story collections including: Neverwhere, Stardust, The Ocean at the End of the Lane and the masterpiece that is American Gods.